Do I Support Net Neutrality? In 2015, under the Obama administration, rules were enacted that prohibited internet providers from increasing charges for specific content or giving certain websites preferential treatment. These rules came to be known as “net neutrality” and were quickly taken away after the FCC voted to repeal them in 2017. The repeal ignited a strong reaction from both the public and Democratic lawmakers, many of whom are pushing for the decision to be overturned. So what exactly is net neutrality, and what does its repeal mean for you? How many Americans are knowledgeable about the policy, and how many support it? We compiled a list of the basic tenets of net neutrality and converted them into questions to gauge the public’s understanding. Using these questions, we surveyed over 1,000 Americans to measure their familiarity with net neutrality and their positions on the issue. The basis of the internet is to connect people. Since it’s always been open for all to use, the government’s role in overseeing the rules of the web has separated people and sparked a bipartisan debate. Democrats have long supported federal regulations over the internet to prevent large companies and providers from taking advantage of and exploiting Americans. With backing from Google, Amazon, and Facebook, net neutrality passed as law in 2015. But as tables turned and Republicans entered the White House, their disapproval of government interference spurred the Republican-led FCC to repeal net neutrality. It’s obvious the two parties don’t align on the issue, but what exactly is the policy they disagree on? Net neutrality is the principle that internet service providers (ISPs) should treat all data and content on the internet equally without regard to the user, destination, or source. Put simply, net neutrality is equality for the internet and everything it provides. 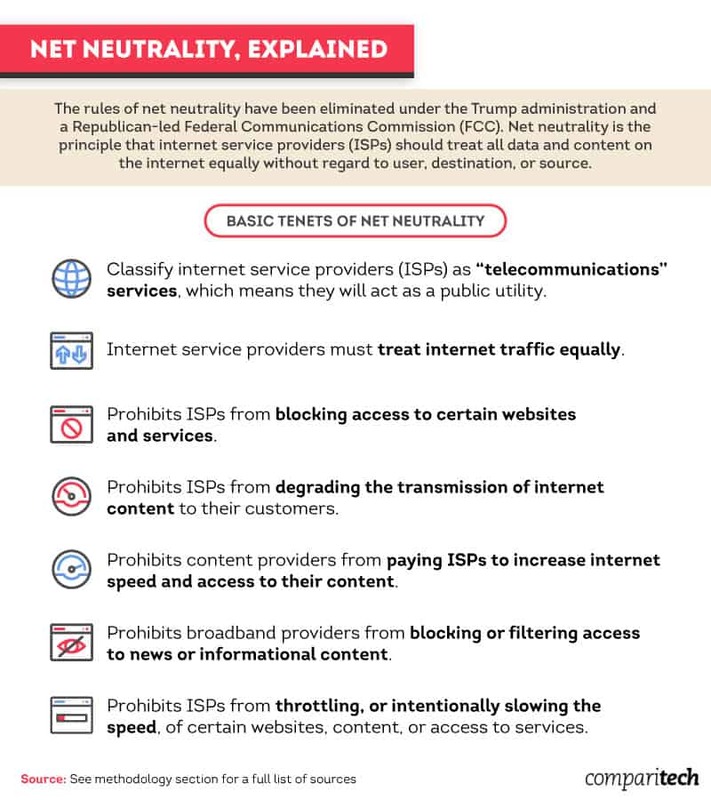 The specific principles of this policy include classifying ISPs as “telecommunications” services and prohibiting ISPs from blocking access, degrading transmissions, and slowing the speed of content. The policy also prevents content providers from paying ISPs to increase internet speed and access to their content. Despite partisanship among government officials on this issue, the American public isn’t as split. Over 4 in 5 Americans said they supported net neutrality, and the majority of Democrats, Independents, and Republicans were also supporters. Democrats were the most likely to support this policy (over 86 percent); however, 77 percent of Republicans supported net neutrality. Support didn’t vary much when looking at the generations, either. Interestingly, almost the same amount of baby boomers supported net neutrality as millennials, with support at 82 percent and 83 percent, respectively. While millennials are known for their technology use, older generations are catching up in technology ownership and social media use. Net neutrality isn’t just an issue that Americans support — it’s an issue that Americans think is important. Only 9 percent of respondents said the preservation of net neutrality was unimportant. Even when split between Republicans and Democrats, the two parties believed it was important; however, Democrats felt more strongly about it. While 61 percent of Democrats rated the preservation of net neutrality as very important, 31 percent of Republicans felt the same. 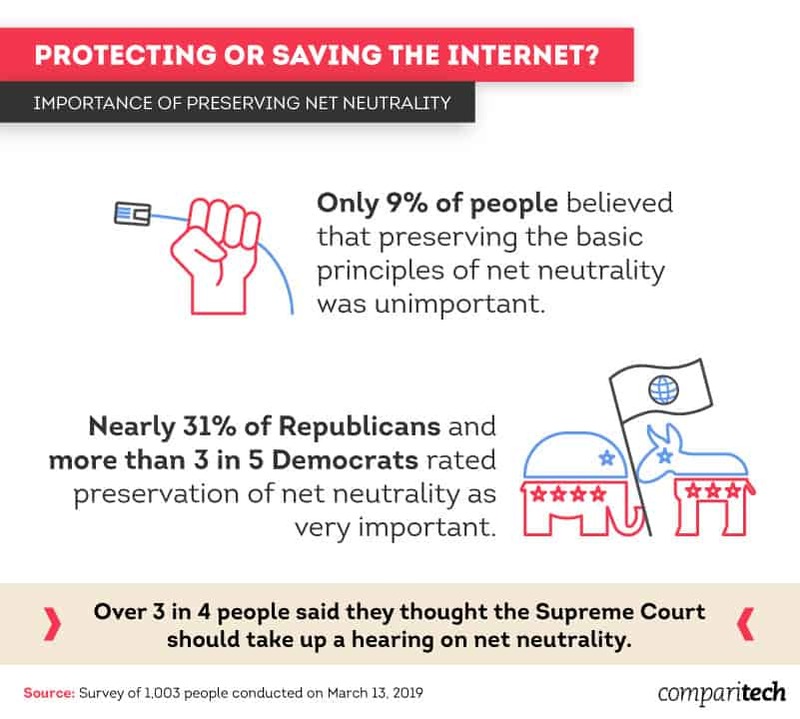 Americans view the issue as important enough that over 3 in 4 people said they thought the Supreme Court should take up a hearing on net neutrality. A hearing at the Supreme Court level may not go the way the public wants, though: In November 2018, the Supreme Court rejected attempts to overrule the FCC appeal. 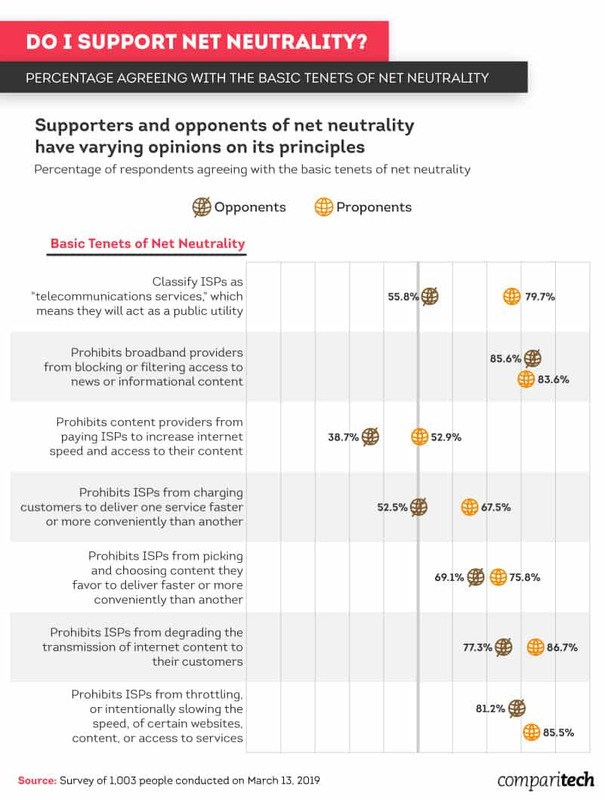 To gauge how opinions vary between proponents and opponents of net neutrality, respondents rated their agreement with various statements related to the basic tenets of the policy. Surprisingly, both proponents and opponents seemed to view most statements similarly. The majority of both sides agreed that ISPs should be unable to throttle certain websites, content, or access to services – 86 percent of supporters and 81 percent of opponents agreed with this statement. About the same percentage of each group agreed with prohibiting ISPs from degrading the transmission of internet content to their consumers. Opponents and proponents alike were also largely supportive of making sure broadband providers were unable to block or filter news and informational content to their customers. Where the sides differed most was when asked whether ISPs should be classified as “telecommunications services” and act as a public utility. While 80 percent of net neutrality supporters thought this shouldn’t be allowed, only 56 percent of opponents agreed. Despite some respondents disagreeing with certain tenets of net neutrality, 90 percent believed everyone should have equal access to the internet. And for those who opposed the policy, over 1 in 4 admitted they didn’t understand its basic principles. A lack of understanding is clearly seen when comparing support by name versus support by principle. The survey found that only 34 percent of net neutrality opponents actually disagreed with the basic principles of net neutrality. 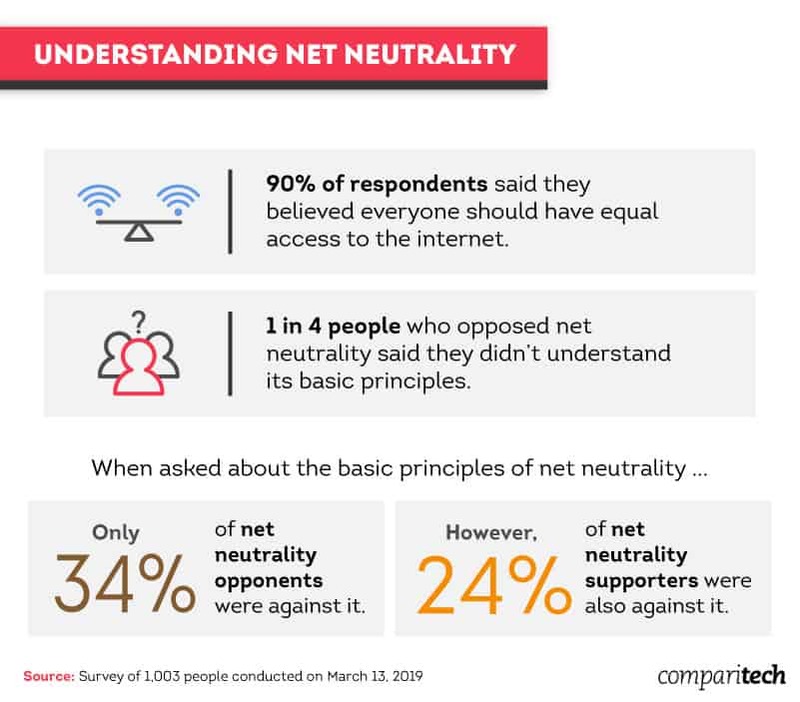 The opposite was also seen when looking at net neutrality supporters; 24 percent of proponents opposed the basic principles of net neutrality. Although net neutrality was repealed in December 2017, the effects have yet to be seen. So, what are people expecting to happen? Sixty-eight percent believed the repeal would lead to censorship or blocked content, and 64 percent believed customers would receive different services and web speeds. Although not a direct effect of net neutrality, 18 percent thought the repeal would cause an increase in illegal online activity. Eight percent, however, said they thought no consequences would come from the removal of the policy. However, experts say the change will take place over time, and consumers won’t see an immediate effect. One of the biggest consequences associated with repealing net neutrality is an increased price for specific content or services. Respondents were willing to pay a median premium payment of $10 for access to video streaming services, and 48 percent would do so. On the other hand, only 24 percent would pay for music streaming services, despite the median cost they’d be willing to pay set at just $5. 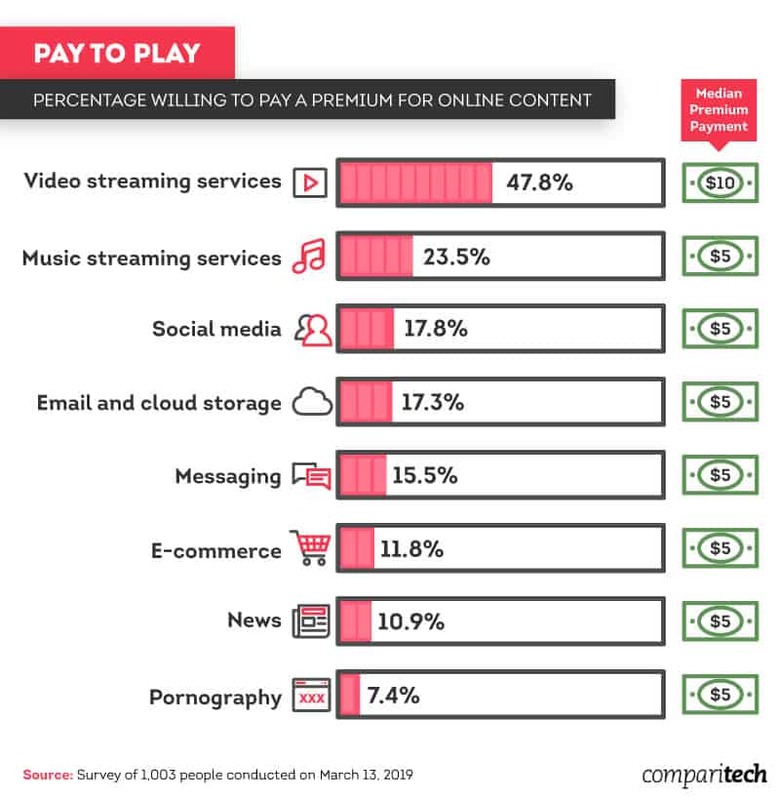 Compared to other content like social media, people may be more willing to pay a premium for video and music streaming services, seeing as platforms like Netflix, Hulu, Apple Music, and Spotify already charge a fee for access. 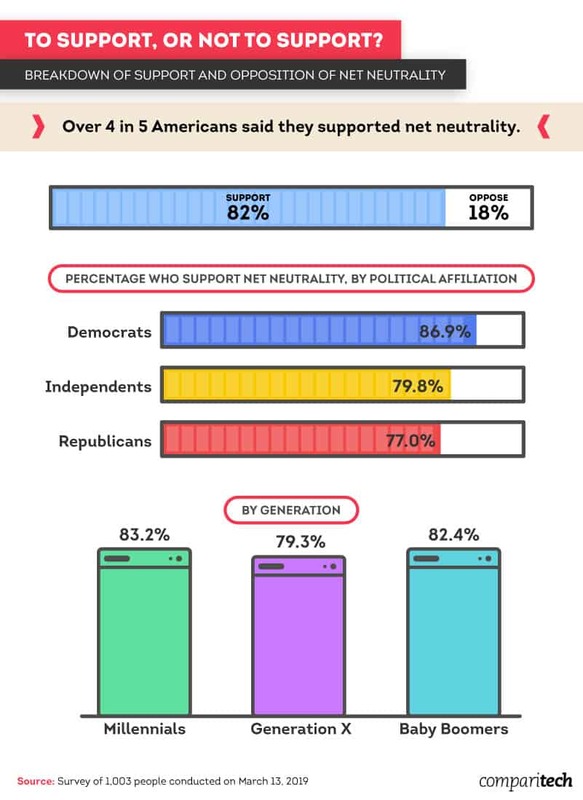 The majority of the American public seems to support net neutrality, despite partisanship among government officials. Support, or lack thereof, isn’t necessarily tied to knowledge about the policy, as many can define net neutrality as a starting place. However, when it comes to the potential to pay more for services, some aren’t deemed worthy of a premium payment. Regardless of support or opposition for net neutrality, the repeal may lead to an increased price for certain services. Knowing which services are worth the price is vital in the coming years, and Comparitech is here to provide you with the information you need to make the right decision. Find out more information about the best VPN services to ensure your own net neutrality, as well as the all-around best VPN services to use. Additionally, browse hundreds of products and services, all compared and reviewed for your convenience. For more information, visit us online today. We compiled a list of nearly 15 of the basic tenets, or principles, from at least three reputable sources and converted them into questions to gauge respondents’ understanding of net neutrality. Respondents were presented a series of questions about the basic principles of net neutrality and were asked to rate their agreement with each. Once completed, respondents were then asked to declare their position on net neutrality. To determine the percentage of participants who opposed the basic principles of net neutrality, we pulled all responses that disagreed with each of the tenets (of the respondents who opposed net neutrality by name) to find the overall average. From there, we determined the percentage of respondents who said they opposed net neutrality by name and by principle. For this analysis, we used Amazon’s Mechanical Turk to administer online surveys to 1,003 participants on March 13th, 2019. To qualify for the survey, respondents were required to have access to the internet. Fifty percent of respondents identified as female and 50 percent were male. The majority of respondents, 60 percent, identified as millennials, while 27 percent were grouped into Generation X, and 11 percent were baby boomers. The remaining 2 percent of respondents identified with Generation Z or the silent generation. Forty-eight percent said they were Democrats, 27 percent were Independents and 25 percent were Republicans. Attention-check questions were used throughout the survey to demonstrate that participants were paying attention and entering consistent data. Respondents who failed to answer an attention-check question properly were excluded from our findings. The main limitation of this study is that the survey data rely on self-reporting, which is subject to flaws such as telescoping, selective memory, and exaggeration. Another limitation of this study is that since the survey was conducted online, participants may have more knowledge in regard to the topic at hand. No statistical testing was performed on the claims made in this study, so the findings above are solely based on means. Know someone who could learn more about net neutrality or has a strong opinion on the matter? Feel free to share the graphics and content of this project for noncommercial purposes. Just don’t forget to link back to this page so that the authors receive proper credit.